A weird and wonderful way to get introduced to the motoring world. It had bicycle pedals to help it up the steeper hills (and to pedal down the road to get started), acetylene lighting (always hoping one had a match), and one had to remember to pump a shot of oil into the engine every 5 miles. To help with starting on a cold morning one opened a little tap under the tank and dribbled a few drops of gas into a funnel on top of the cylinder; the funnel also had a tap to open to let the gas in, then it had to be closed to keep the explosion in! 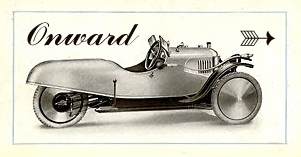 The one pictured above appears to be the exact model, 1914. Mine, however, had an addition called an NSU gear. The original machine had only one gear ratio, dictated by the difference between the belt drive small pulley on the engine and the large belt pulley attached to the spokes of the rear wheel. To help with this disadvantage when climbing a hill, there were bicycle pedals included, driving a chain to a sprocket on the back wheel. This rear wheel sprocket was a free-wheeling one, as with most bicycles in England. There was a clutch housed in the large hub of the rear wheel, operated by a foot pedal, that permitted the engine to be running and turning the large pulley freely until one eased the clutch pedal and got into motion. One of the problems with this drive was that in rain the belt would happily slip, particularly going uphill. The NSU gear which had been added gave one a whole raft of gear ratios however. It worked, like its resurrected descendants, the continuously-variable transmissions [CVT] becoming so popular again, by squeezing the shoulders of the engine pulley or relaxing them. 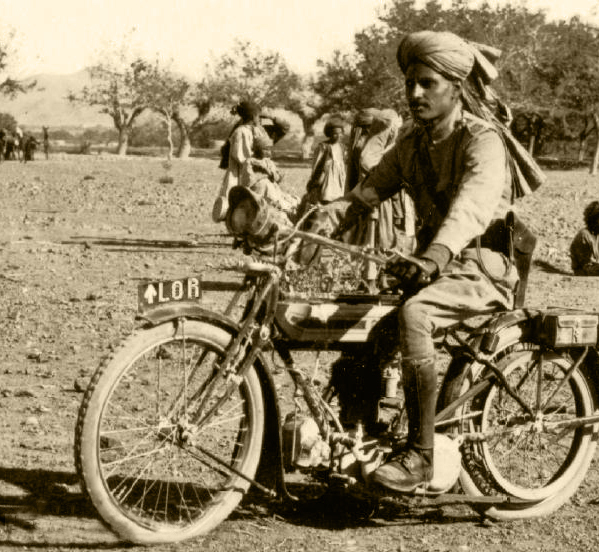 Operated by a handle mounted on the upper side of the gas tank, it permitted one to fully relax the belt, or gradually to tighten it, thus rendering the clutch in the rear hub obsolete. This gear does appear in your picture. Mine also had a large acetylene headlight, and a small red rear light. 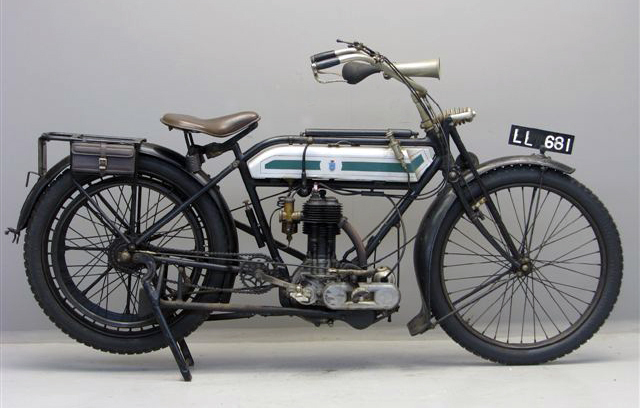 Further details on the above pictured bike are available at Yesterdays Antique Motorcycles. Busby Britten's opera "Patel Grime", it isn't. At all. Thanks to team-bhp.com for picture.